We highly recommend that you replace your filters at least once per year and clean them once per month. The dreaded FLO error message is a direct result of dirty and over-the-hill filters. In the long run, it is much cheaper to regularly replace your spa filter cartridges than have to pay for a new pump or heater. We've made choosing the right filter cartridge easy. 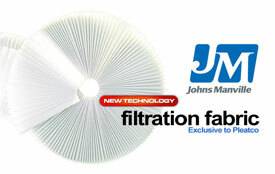 Click below to watch a short video on identifying the filter you are replacing. Pleatco filters are definitely not the cheapest for America's SPA-MART to carry. But we think they are worth it. 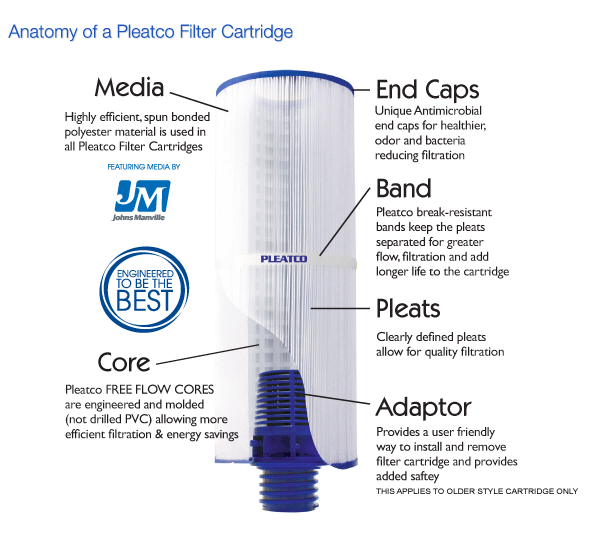 Watch this short video to discover why Pleatco filters stand above the competition. 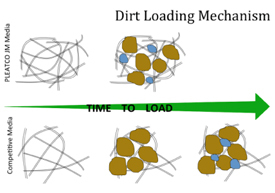 A cartridge filter, traps the dirt within the web of its media, the larger particle gets plugged into those webs and the smaller particles are by passed until encountered by a smaller web opening or a pre existing dirt particle. The image above is the indicative of how easy it is for our JM media to capture fine particle dirt as compared to other competitor media. Making Pleatco cartridges perform 30% faster than Reemay media and much more efficiently than other competitor media. The MEDIA serves as the filtration surface. At Pleatco, we only use Johns Manville media, the highest quality spun bonded polyester material for all of our filter cartridges. Blue: High grade, cost effective spun bonded polyester with PLEATCO+PLUS Antimicrobial technology. Pleatco FREE FLOW CORES are superior as they are designed to significantly enhance the filtration process over any other competitive product. 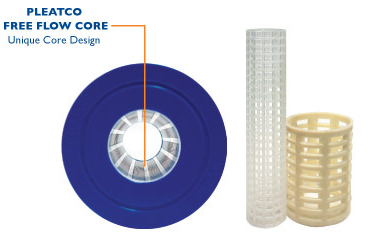 Pleatco's cores are "engineered" as opposed to all other cartridge manufacturers who simply use PVC pipe with holes drilled in them. 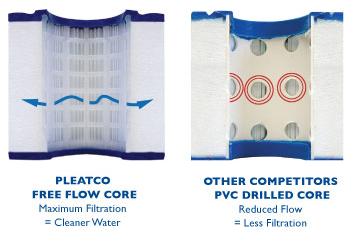 Pleatco FREE FLOW CORES deliver better water flow rates, giving enhanced filtration and reducing wear and tear on the pump and therefore, also uses less energy. The BAND keeps the pleats separated helping water to easily flow through the filter. Pleatco's bands are the strongest in the market and ensure that the pleats are separated even under great stress. America’s SPA-MART has the largest variety of quality spa filters, hot tub filters, and spa filter cartridges of all kinds and all brands on the Internet. From Pleatco to Onyx and dozens of other top name brands, all of the accessories and filters that we offer to our customers stand on a reputation of quality and reliability. No matter what size, brand, or model you might need, there is a great chance that we have exactly what you are looking for. The best spa filters and cartridges are built to OEM design specifications for quality and reliability, so you can be sure that every one of our products will work exactly as you need them to for as long as you need them to. With the latest designs and models in filtration technology, our filters are guaranteed to keep your spa or hot tub clean, beautiful, and healthy.